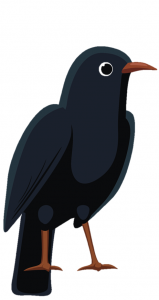 In Chough Class (Choughs are the black birds in our school emblem), we have all of the Year 2 and 3 children and some of the Year 4 children. Our teacher is Mrs Scaplehorn and our teaching assistant is Mrs Philpotts. We have a lovely classroom with large windows looking out over the Church. Wow! What beautiful weather we have had! Mrs Philpotts and I hope you’ve had a really lovely Easter holiday. This term, we will be taking our inspiration from The National Gallery’s ‘Take One Picture’ scheme. We will be responding to the painting ‘An experiment with a bird in the air pump’ by Joseph Wright through our science topic of Light and Shadow which will be linked to our literacy and art work. Please make sure that you continue to read on a daily basis, learn your weekly spellings and practise your times table target. All children will have a homework book. A homework grid of tasks will be handed out at the beginning of each term. It is expected that Year 2 and 3 children will choose at least one task from the grid to complete each week. Year 4 children will be expected to complete two tasks from the grid each week. All children will also be expected to learn their weekly spellings and practise their times table targets. Homework due in every Monday and books returned to child every Wednesday. Spellings given out and tested on Tuesdays. All children will have a Reading Record Book which should be kept in their book bag. Year 2 children will have their book bags checked and their books changed regularly by our class teaching assistant Mrs Philpotts. It is important that their reading records are completed at home so that we know when their books need changing. Year 3 & 4 children will be expected to change their books and fill in their reading records independently. However, if you have queries about their books please do not hesitate to pop in and ask. I would expect all children to be reading at home with an adult for a minimum of 20 minutes most evenings. Please can you make sure that P.E. kits are available in school all week. Swimming will continue on Monday afternoons from Monday 10th September for all children in years 2, 3 and 4. Please can you make sure that your child brings their swimming kit to school every Monday and that all items are clearly labelled.